Salco SP50B-777 air plier stapler with "B" anvil. Uses 777 series staples. Salco SP50B-777 pneumatic plier stapler with elevated "B"-type anvil for working around a lip or seam. Uses 777 series staples - 3/8", 1/2", 5/8". 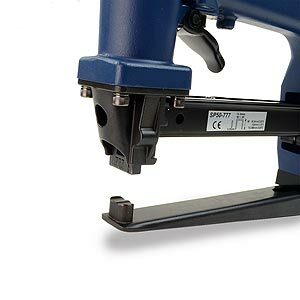 Specially configured B-type anvil for applications which require working around a lip or seam, such as plastic clamshell packaging or raised panel header cards. Also suitable for certain mattress box-spring or upholstery applications where the ability to "reach over" an element of the piece to be fastened is needed.